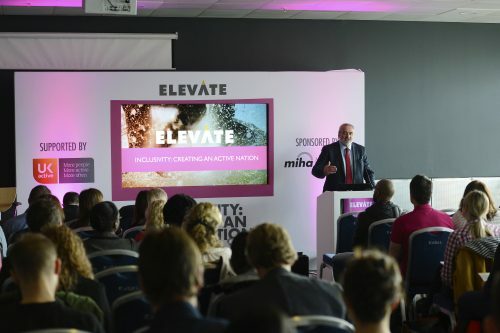 As many of you will know one of the must attend conventions in the UK for me is Elevate Arena, it is an awesome conference that is aimed at those involved in the world of physical activity and health promotion. I have been attending this event for a number of years and loved it every time I attend! Elevate Arena is a two day event held at Excel in London, this year it is on 9th and 10th May. For me this will be the first year that I will be making the trip a stop over and doing both days. I have decided to do this as the amount of knowledge and networking that I manage to get done in one day is amazing so I though lets double up on that and do both days! My main aims at Elevate as with any other convention are two fold. Firstly get my learn on, and listen to as many experts in their field as possible and absorb as much of that knowledge and advice as I possibly can. Secondly network, I am pretty active on social media… although this is something that I will be taking up a gear in 2018. One of the things that I have found is that attendance at Elevate and other conventions like it (see my list of the UK’s best fitness conventions) allow me to get some time with people that I have only ever conversed with on social. This helps me to really strengthen some of these relationships and also meet as many new people as possible. So what am I looking forward to at Elevate Arena? 11:40 – Does exercise have an impact on obesity? I am looking forward to the discussion chaired by Dr Steven Mann around the impact that exercise has on obesity. Always a hot topic and set for a great debate. 12:50 – Michael Mosley, this is going to be a very popular slot on the conference schedule, with this keynote from the doctor behind a number of the BBC documentaries on a range of health issues. 13:50 – Exercise is dead, long live social prescribing. With exercise referral and the schemes that offer these services being a key focus from myself and one of my areas of speciality I am looking forward to this discussion on the topic chaired by Dave Buck. 14:40 – Nutrition: A guide for the fitness industry. Dr Glenys Jones will be chairing a discussion on the various types of diet out there and how fitness professionals can take an evidence based approach to their advice. 16:30 – Working with GPs to prescribe exercise. This session should be a good one with Dr Zoe Williams, looking forward to hearing ideas on how exercise professionals can work better with GPs to help people get more active. 10:40 – Here’s how you really make money from personal training. Looking forward to this one as there are so many misconceptions about the business of fitness, excited to hear what the panel’s viewpoints are. This is all chaired by Paul Swainson. 12:40 – The importance of vitamin D for performance. This is a real hot topic at the moment and one that I have a big interest in after my own journey of supplementing vitamin D.
15:10 – Are we selling physical activity all wrong? Kate Cracknell is chairing this discussion on how physical activity and participation is pitched to the public and if there is a better way to do this. To see the full programme have a look here. So if any of you guys are going to Elevate let me know and if you want to come along to a talk with me or just grab a coffee at some point give me a shout in the comments or on social! If your not going, I have one question… why not. Have a look at the Elevate Arena website, my review of Elevate the event and see what you get for FREE.. Yes this is a free convention!